Regular use of Defender will prevent mineral buildup from occurring and causing the spa's heater or equipment to fail. Also aids in the removal of existing scale. 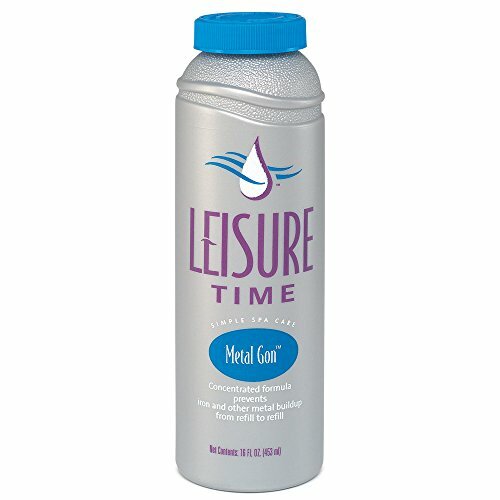 The perfect follow up to Leisure Time Metal Gon, applied at start-up.Compatible with all hot tub sanitizing chemicals and spa sanitizing chemicals. Weekly Instructions: Add directly to spa. Use 2-ounce for spas up to 800 gallons. Use 4-ounce for spas over 800 gallons. Run filtration system for one hour, or normal filter cycle. Fast, easy and accurate spa water testing with the dip of a strip. Simply dip a strip in the spa or hot tub water, and compare to the color chart on the back of the bottle. 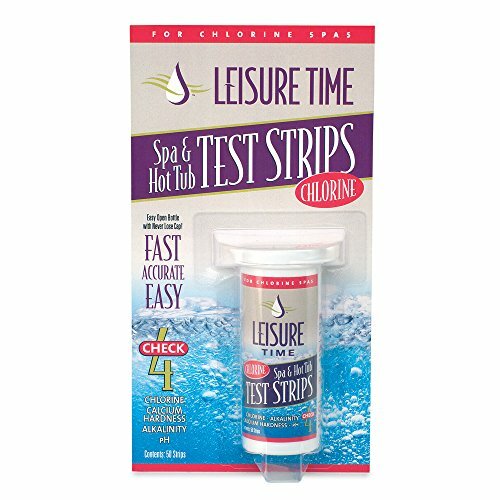 Easy-to-read spa test strips and hot tub test strips test spa water for: pH, total alkalinity, calcium hardness and chlorine. Compatible with chlorine and ozone sanitizers. A powerful blend of natural enzymes that breaks down oil, lotion, and organics that cause unsightly scum lines and odors in spa water. Helps reduce the need for maintenance of filters and spa surfaces. Works with all types of sanitizers. Use weekly as part of the Simple Spa Care Program. Compatible will all types of spa chemicals and and will not interfere with spa filters. Initial Treatment: Add 1-ounce per 250 gallons of spa water. Repeat daily until scum line is gone. Weekly Treatment: Add 1-ounce per 250 gallons of spa water weekly to avoid buildup at water line. Leisure Time Metal Gon is easy to apply and the concentrated formula prevents iron and other metals from staining surfaces. Use with each refill to quickly neutralize metals in source water and prevent unsightly stains. Applications: Start-Up: 1) Turn OFF all equipment. 2) Pour entire bottle contents evenly around spa edge. 3) Run filter for at least 30 minutes. Tips: The best time to treat for metals is when you first fill the spa or drain and refill the unit. Using Defender each week will control metals after the application of Metal Gon at start-up. Compatible With: Chlorine, bromine and biguanide sanitizers. Low-Odor, low-dust tablets fit all floaters. 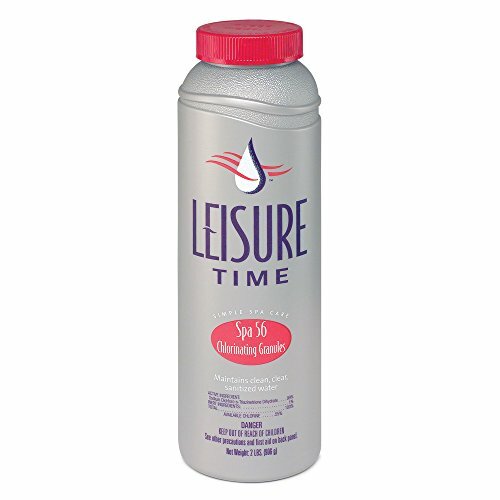 When used as directed, this product will disinfect spa and hot tub water, keeping it clean, clear and free of odor. This product gives the effectiveness of chlorine without the chlorine odor. 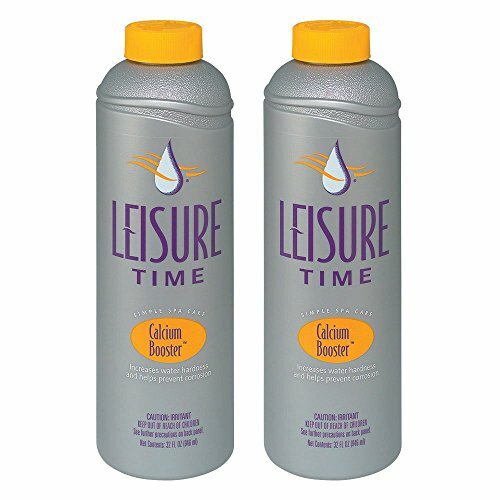 The Leisure Time Calcium Boost liquid calcium hardness booster quickly increases spa and hot tub water hardness to prevent corrosion of pool equipment. Compatible with chlorine, bromine, ozone and biguanide sanitizers. One ounce raises the calcium hardness 7 ppm in 500 gallons of water. Instructions: Turn jets ON to circulate spa water then pour required amount into the water. Run filter for 1-2 hours and then retest water to ensure proper hardness level has been reached. Repeat until proper level of 150-400ppm is obtained. Fast-dissolving tablet non-chlorine shock treatment works instantly, with only minutes of spa down time. Rids spa water of residual soaps, deodorants, natural oils and organic materials that can build up in spa water. When added to spa water, this fast-dissolving non-chlorine shock quickly destroy any microorganisms left behind by bathers. pH buffered to prevent any fluctuations in the spa or hot tub pH level. After each spa use, turn on filtration system. Add 3 tablets directly to the spa for each 250 gallons of water. Run filtration system for 15 minutes with cover off. Repeat process once a week to help maintain clear, odor-free water. 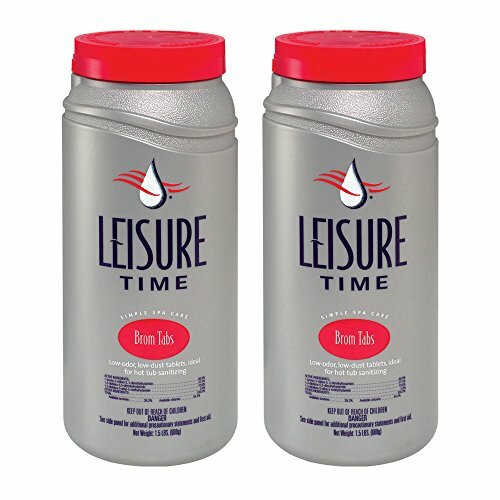 Compare prices on Leisure Time Hot Tub Chemicals at ShopPlanetUp.com – use promo codes and coupons for best offers and deals. We work hard to get you amazing deals and collect all available offers online and represent it in one place for the customers. Now our visitors can leverage benefits of big brands and heavy discounts available for that day and for famous brands.